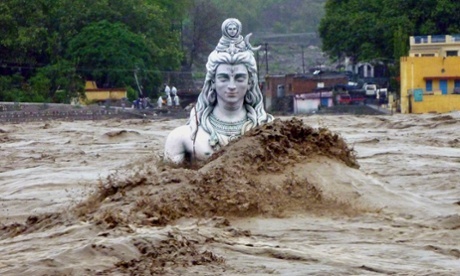 Indian floods: thousands stranded in northern Himalayas - Annapurna Travel & Tours (P) Ltd. The Indian air force has dropped food and medicine to assist tens of thousands of people trapped in up to 100 towns and villages cut off by monsoon rains and landslides in the northern Himalayas. Soldiers and other workers reopened dozens of roads by building makeshift bridges, accelerating the evacuation of nearly 62,000 people, said a Uttarakhand state spokesman, Amit Chandola. More than 2,000 vehicles carrying stranded Hindu pilgrims have travelled from the area since Thursday, he said. With the sun shining for a third day, thousands of soldiers continued efforts to reach the worst-hit towns and villages. The official death toll in Uttarakhand was 105, Chandola said, but was likely to rise as authorities reached cut-off areas. Rakesh Sharma, a state official, said the total number of deaths could soar to several thousands, although the exact figure would not be known until the entire region had been checked. A further 17 people died after their homes collapsed in neighbouring Uttar Pradesh state, said a state police officer, RL Vishwakarma. The rescue operation centred on evacuating nearly 27,000 people trapped in the worst-hit area, near Kedarnath temple, one of the holiest Hindu shrines to Lord Shiva, atop the Garhwal Himalayan range. It escaped major damage, but debris covered the surrounding area, killing several pilgrims. Twenty-two air force helicopters have been ferrying rescuers and doctors, along with emergency supplies, to and from Kedarnath, the town nearest to those trapped in the valley, said Air Commodore Rajesh Prasad, who has been overseeing the operations. On Friday, hundreds of people searching for relatives demonstrated in Dehradun, the state capital, where survivors were taken by helicopters. They complained that evacuation effort was too slow, with small helicopters transporting only four or five people at a time. Flooding washed away roads and nearly two dozen bridges, demolished 365 houses and damaged 275 others in Uttarakhand, the state government said. Most of those stranded are Hindu pilgrims who were visiting four revered shrines.